Pinterest is my escape in the small moments that I need solace. It helps me dream, plan, and make life easier. The amount of projects and ideas that are on Pinterest will leave me creating, and aspiring for the rest of my life. So, here are my favorite pins from last week. 2. Amber Fillerup Clark hair. 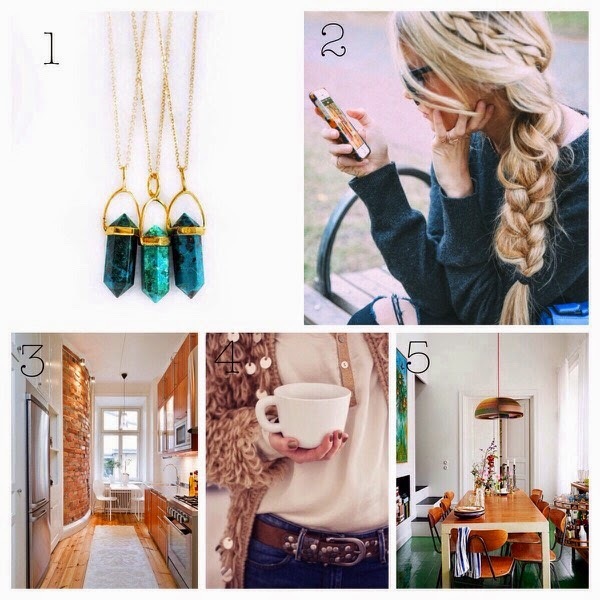 I love Barefoot Blonde blog, by Amber Clark. She has amazing style, and amazing hair. I always get my hair styles from her because she knows how to make braids look awesome! 3. Kitchen. I love how light this kitchen is. I do like the cozy style of this kitchen, and instead of tile on the kitchen floor, I love the use of hardwood. It is a perfect little kitchen. 4. Cozy Cardigan. The model in this photo looks cozy. The sweater looks so soft, and warm. It would a great sweater to wear for a Winter gathering. I love the whole outfit. 5. Eclectic Dining Room. That table has my heart. This whole room is wonderful. The colors of the art choice, and the flowers at the end of the table create a magical area. This would be such a lovely space to eat breakfast in every morning. Can you tell that I love it when rooms make the most of natural light? I have some fun posts planned for this week! I hope you go check out these pins via the links provided, or go pin them from my pinterest. You can find my Pinterest in the side bar if you like what you see here to find similar pins. I have a busy Monday ahead of me, and it is only the middle of the day. I hope you all have a great rest of your Monday!